If you’re doing your research and still can’t decide which clinic to choose, or if you’re mid-way through your treatments and not enjoying a long drive, or even if you’re just plain upset about how much your treatments might cost, we might have something that will ease your frustration. A large part of the decision to begin the tattoo removal process comes down to how much will need to be spent to remove your ink, or fade it enough for a cover up, should that be your choice. In most cases, the price of the service will reflect its quality. Unfortunately, like many things, if you’re looking for the cheapest option, the chances are there is a reason for it being that way. This being said, there may be circumstances where you’ll find a really good deal! With our discounts, customer rewards and maximum payment guarantee we believe our current prices are very competitive for the quality of service we provide. However, if you manage to find a better priced service, we’ll be more than happy to match it for you should it meet our terms and conditions, which will be provided with every enquiry. The quote matched will be the original price per treatment before any discounts were applied, and you’ll then have access to all of our current offers, including your 5th treatment at half price with our rewards program. By putting this price match guarantee in place we ensure you’re provided a service of the highest standard, at the absolute best price. Feel free to get in touch for more details! 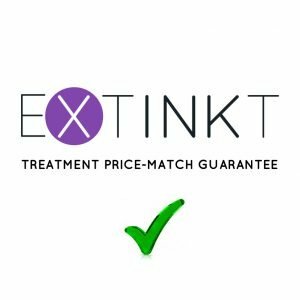 Extinkt are proud to deliver a service of the highest quality at our Campbelltown location, maintaining our position as a premier provider of laser tattoo removal in Sydney.